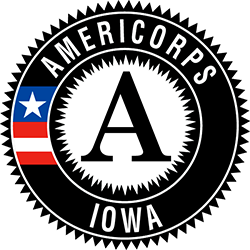 Iowa State University (ISU) Extension and Outreach – Woodbury County is hiring two quarter-time AmeriCorps 4-H Environmental Education Workers, to assist in environmental education at youth summer camps and efforts at school and community gardens. Educating youth to understand how the environment reacts, and why, is essential to preserving Iowa's soil, water ways, and crop production. AmeriCorps 4-H Environmental Education seeks to forge a healthy relationship between young people and the great outdoors. Research shows that youth who experience diverse natural settings and play areas are more physically active, aware of good nutrition, and more civil to one another. Being outside can ease symptoms of anxiety, depression, and attention disorders, while AmeriCorps 4-H members create programming which teaches youth to question, think critically, and problem solve more effectively. AmeriCorps members develop skills that build a strong, leadership-packed résumé, earn a monthly living stipend, and receive the Segal Education Award to pay for higher education or qualified student loans. Additionally, AmeriCorps members may apply for education loan forbearance during their term of service. Nation Service is an ideal step for people who need time to develop their passion, while building the skills to pursue it.